Description: All three viscosities of MicroBond: Thin, Medium & Thick. 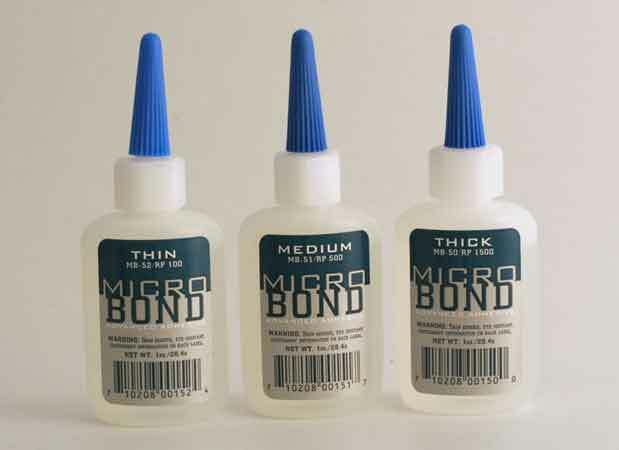 MicroBond is an advanced adhesive and industrial strength. MicroBond has shear strength and will stand up to assorted expansion/contraction properties of different material. Will bond to rubber, assorted ABS and styrene plastics, brass, steel, resins, leather, wood, etc. Not intended for foam surfaces. For bonding to delrin, celcon, etc. treat the bonding surface with MicroPrep prior to bonding. Bonds in a seconds, Cures in 5 minutes.